If something is digging up the sod at night, you might have a skunk in your yard. 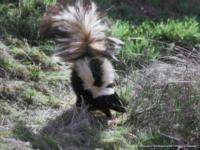 Skunks are common in California, and are well-known for spraying a smelly liquid as far as 6 to 10 feet when disturbed. Skunks are nocturnal, and feed on a variety of foods including insects, grubs, mushrooms, berries and fruit, pet food, and bird eggs. They cause damage by digging for grubs and other insects in the garden and in the lawn, even rolling back sod looking for insects. Skunks are classified by the California Fish and Game Code as nongame mammals; poison cannot be used to kill them. They cannot be relocated by homeowners without a permit, mostly because skunks are a primary carrier of rabies and other transmissible diseases. A physician should always be seen immediately for skunk bites; dogs and cats should be seen by a veterinarian. Because they are active at night, it is sometime difficult to know if skunks are causing your problems. Exclusion is the best method to keep skunks out of your garden. The best fencing material is 1/4-inch mesh hardware cloth buried at least 6 inches into the ground to keep them from digging underneath. Repellent sprays are not very effective. If they are digging in the lawn, another approach is to eliminate the grubs that are attracting the skunks. This mixture should be made fresh for each use; it does not keep. Rinse thoroughly with water after applying the peroxide solution. Read more about management of skunks.